ASP.NET Forums/General ASP.NET/jQuery for the ASP.NET Developer/want to add new chatbox on button click? want to add new chatbox on button click? i want to add new chatbox in website like facebox.i am using jquery.ui.chatbox api its working fine but i wanted to add new chatbox on button click but i am not able to get the desired result . Re: want to add new chatbox on button click? i wanted to add new chatbox on button click but i am not able to get the desired result . 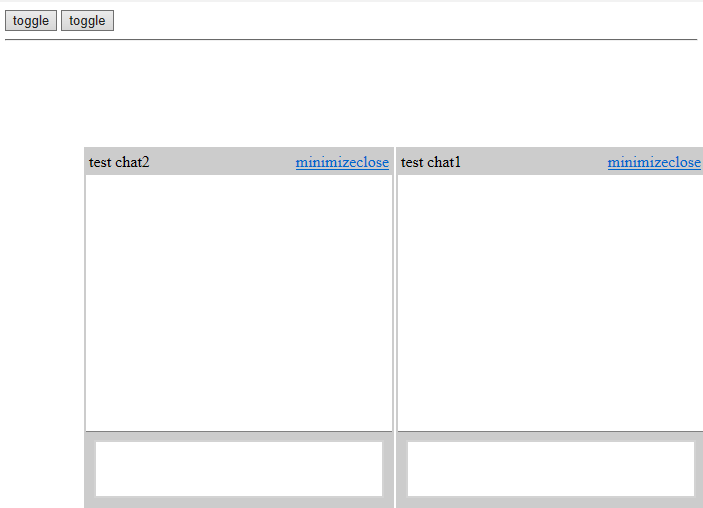 The first chatbox code work as expected, you can refer to it to create another one, based on my test, both chatbox right property will be 0px, so two chatbox will display at same place in web page, if you don’t want that, you can override the right property of the second one. The following sample work for me, please refer to it.